What Does Google Do Post Facebook's WhatsApp Acquisition? Facebook has spent money like anything and acquired Whatsapp at a whopping $16 billion (or $19 billion if you count the next four years). This deal gives Facebook 55 new employees and 450 million users. It is of note that not all users will be unique. In fact, with Facebook’s huge base, most users that Facebook is getting from WhatsApp might already be present on Facebook already. After all, it is the mother of all social networks. Still, there are multiple reasons that has led Facebook to buy Whatsapp. The primary one is of course that while Facebook is still used by a lot of people, it lacks the intimacy and instantaneousness that is provided by Whatsapp. How Facebook will utilize this is yet to be seen. It is not necessary for Facebook to monetize the app instantly. After all, Facebook took its time to monetize itself. In fact, it is quite possible that the prime motivation for WhatsApp’s acquisition was to not let Google lead in the mobile arena. Facebook and Google are having a rivalry in the social arena. While Facebook beats Google+ easily, Google has been ruthless in G+ implementation across the board (Youtube comments anyone). Also, because of Android, almost everyone in the world has Gmail account and by extension a G+ account in waiting. Also, with Google Hangouts including everything from phone messages to video calls, FB chat is threatened. From Facebook’s perspective, this is not a good thing. They have tried a lot of things to implement Facebook on phones from themes to launchers but beating the company who actually made the OS is not an easy task. However, both hangouts and FB chat are second to Whatsapp where messaging is concerned. The social messaging app dwarfs the two. Therefore, with this acquisition Facebook has gained a huge lead without actually fighting Google. Obviously, it won’t sit well with Google. They will get more aggressive for sure, in promoting Hangouts. While Hangouts is a great option owing to its integration across PC and mobile, it has not been able to attract users in big numbers. Also, I think they will probably try to buy a Whatsapp rival. It is not necessary, as Google itself has enough resources to create something they want but this will be in their mind for now. With each new Android iteration, the Google integration has increased substantially and I suspect that this will increase in the messaging department even more. How will it happen is yet to be seen but it is almost inevitable that Google will come up with something to counter this new development. I just hope it isn’t hurried or too rash (Like Google buzz/wave, anyone remember those platforms from Google?). What do you think? 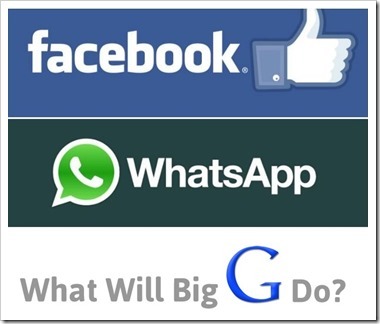 Should the big G be threatened by Facebook’s acquisition of Whatsapp? Housing.com Launches World’s First 3D Projects Platform! Looks like you hate Google and Praising Facebook. YouTube is Google’s property and their wish to make it better. I did not face any problem while commenting with Google+ on YouTube. However, it is again added advantage for YouTube Channel owners to gain additional social traffic. WhatsApp: Yes, Google failed with Google wave. But they came up with other better one (Google+). That means they are trying to create innovative products for users. Can you tell me Apart from Facebook, any other products from Facebook? We use Google products (Free) in most of our internet life. Starting from Google Search, YouTube, email for Gmail and Office works with Google Docs, backup storage with Google Drive, Adverting my product with Google Ads, and making money from Google Adsense… All most I am running my business in Internet with these Google’s Free Products. What Facebook is doing here…?!!! Even your blog (trak.in) depends on Google Adsense, Traffic from Google Search, Social mentions from Google+, Google Analytics, Google Webmaster Tools, Google Fonts…. All for FREE. Whereas you are using Facebook’s likes box that is only beneficial to their own tracking purpose. You can say it is social engagement, increase in likes blah blah blah. But growing number of privacy awareness, User’s started altering their privacy in Facebook. I can like your blog post and hide my activity only visible to me. Then you are only benefiting with Facebook likes count. Not with Social Engagement. To gain real engagement you should buy sponsored posts from FB. Ok. Come to WhatsApp. Now they have 450 million mobile internet users. Now they are going to scan all WhatsApp user’s chat message, and based on this FB will show ads for them. Yes. Now it is their own property and they can monetize it. The question is What is really benefit for users? Ads? Living? Business? Productive? (Here I am not supporting Google. Google is evil in some other aspects. But when we thinking of internet and it’s possibilities Google is doing well.